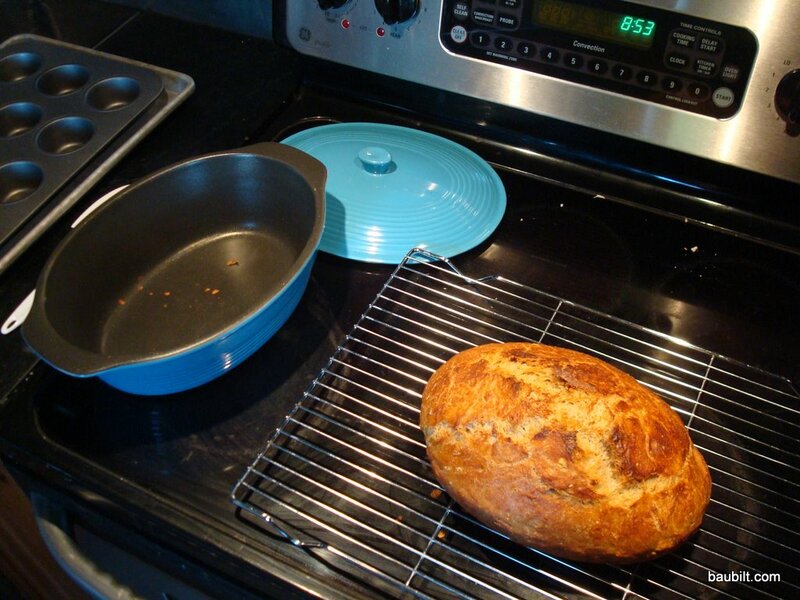 Many people have tried the outstanding no-knead bread recipe adapted from the Sullivan Street Bakery, published in the New York Times (at least twice) by Mark Bittman, and the subject of a lot of follow-up traffic on the internet. Once you’ve mastered Baubilt Bread…or really any of the various Bittman recipe variants, pizza is a snap. I modify the bread dough slightly, using an 80 percent hydration dough (e.g., 80 grams water for every 100 grams flour). I usually mix 700 g flour and 560 g water, which gives me two nice big pizzas. Otherwise, I prepare the dough exactly as for bread. Even at 80 percent, this dough is still much wetter than most pizza dough, so you can’t really roll it or toss it to form a flat shell. Rather, I press it with my fingers and hands to stretch it to fit a rectangular non-stick baking sheet. I use olive oil on the tray and I spread some olive oil on the top of the dough to prevent sticking to my hands, too. Since I like lots of olive oil on the pizza anyway, this is win-win. Once the dough is spread (and good luck getting it to really stretch perfectly into the corners of the pan…you’re going to unavoidably end up with some rebound) I bake for 10-15 minutes at 450F. Then, I remove it from the oven, and apply tomatoes and toppings. Update: I thought about how to avoid that pesky rebound of the dough in the pan. I tried putting mugs in each corner and baking this way for the first few minutes. Worked pretty well, but this may be a bit obsessive. Update 2: Another method that is pretty effective is to apply some olive oil to a sheet of Saran wrap and then lay the wrap over the dough before pressing/stretching. This avoids the sticky hands problem and works quite well. You can apply and re-apply the wrap to different sections of the dough until you’re happy with the stretch. 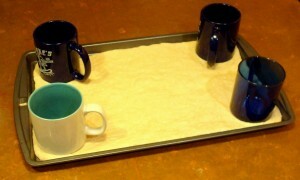 You can put mugs in the corners to keep the dough from springing back. Leave them there for the first few minutes of baking. Careful to remember that they will be HOT. For sauce, I simmer canned crushed tomatoes (Pomi, Furmano’s, Muir Glen, Tutto Rosso…any brand you like) with basil and garlic to remove some of the water (thus preventing soggy pizza). Of course, you can put whatever you want on a pizza. I like broccoli, onions, oil-cured olives, and fresh mozzarella. Update: my method has now evolved to THREE baking steps…first, bake the dough until it is nearly done (10-15 minutes), then spread lots of tomato sauce and bake for another 5-10 minutes (this dehydrates the sauce somewhat, increasing its intensity and further minimizing the risk of soggy crust), and finally add toppings/cheese and bake until everything is nice and melted. The dough should be chewy, crusty, and full of air pockets. Yum squared.